This weekend, chocolate lovers unite as they converge on downtown Manhattan for the 5th Annual Chocolate Show in New York. One of the 50 plus "chocolatiers" showcasing their wares this weekend is none other than the king of chocolate himself, Jacques Torres. He is the host of the Food Network's "Chocolate with Jacques Torres," and owner of Jacques Torres Chocolates in Brooklyn, N.Y. 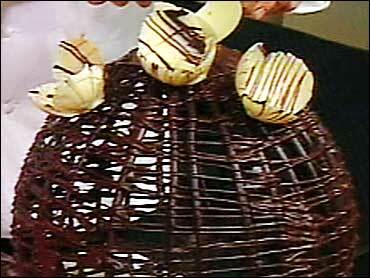 He demonstrates on The Early Show how to make a chocolate birdcage decorated with chocolate flowers. It's actually a simple project that just about anyone can do at home, and it'll impress everyone you know. Torres explains the importance of tempering chocolate and how to do it. Tempering is important because it determines the final gloss, hardness and contraction of chocolate, says Jacques. When you melt chocolate, the molecules of fat separate. In order to put them back together, you must temper it. There are a variety of ways to do it but the result is always the same. Chocolate is tempered when its temperature is between 84 degrees and 88 degrees F.
One of the easiest ways to temper it is to place chocolate in the microwave for 30 seconds at a time on high power until the chocolate it melted. Be very careful not to overheat it; the chocolate may not look as if it has completely melted, because it retains its shape. The chocolate should be only slightly warmer than your bottom lip. You may still see lumps in it once you've stirred it, but don't worry; the residual heat of the chocolate will melt it. You can also use an immersion blender to break up the lumps and start the recrystallization process. Usually the chocolate begins to set (recrystallize) along the side of the bowl. As it begins to crystallize, mix those crystals into the melted chocolate and they will begin the recrystallization process. Jacques likes to use a glass bowl because it retains the heat and keeps the chocolate tempered for a long time. Torres creates the chocolate birdcage by using a balloon and a paper cone filled with chocolate. Dribble chocolate onto balloons in the shape of a bird cage. Then carefully pop the balloon and remove from inside the cage. Next, you'll dip a balloon into colored chocolate and make little "flower cups" that look like they have petals. Then glue them on to the cage with more chocolate and the project is done. An important thing to consider is that if you have a latex allergy, you should not do this project. The latex from the balloon will stay on the chocolate after the balloon is popped, and if you are allergic to latex and ingest it, it could be fatal. The New York Chocolate Show was started five years ago by Sylvie Douce & Francois Jeantet, founders of the renowned Salon du Chocolat in Paris, which draws more than 80,000 visitors each year.